Ar an 21ú Eanáir tháinig ionadaithe ón Airm go dtí An Mhodhscoil chun bhratach na hÉireann a chur i láthair. Sheinn na páistí ó Rang a Sé píosa ceoil dóibh. Sheinn gach páiste sa scoil an fheadóg stáin agus léigh páistí eile cúpla abairtí den forógra féin. Bhí lá mhór ag achan duine. 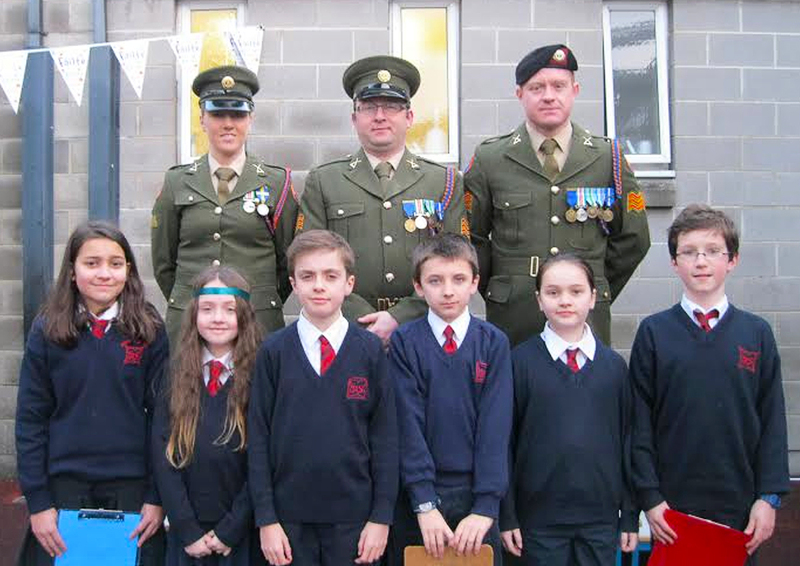 On January 21st representatives from the Army came to An Mhodhscoil to present the Irish flag. Every child from sixth class played a musical instrument (all 60 of them). Every other child in the school played the tin whistle and many of the children got the opportunity to read from the proclamation itself. It was it an absolutely wonderful day.